This is exactly what I've been looking for.. really hope this gets opened up in the SDK :) Great work Steven. Steven: I manage the CoreAnimation team at Apple. Are you interested in working for us? I nice book app called Classics uses page curl too, not sure how they are doing it though. I started to rolled my own effect class to handle effects like this...have a look at it here. thanks a lot for your approach. i really like your style - and your kitten. greetz! Is there any update regarding the proposed source code? I mean if this code is used will it be approved by Apple? Hello Steven, I noticed that some of the methods are private. Will my applicaiton be rejected because of that? @BiBeep Yes, almost certainly. Until Apple provide an official API then you'll have to roll your own or fake it, like some of the examples above. Hello Steven really a great work by you. Thanks so much. Hi Steven its really good work. but it works fine only for some certain pdf files. 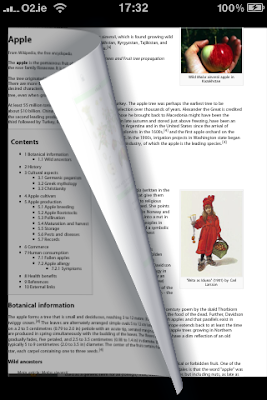 i tried changing the pdf file, the page curl effect is fine but i can't view the pdf text (the whole view turns black). what can be the reason? I can say that using the undocumented pagecurl key did not get the app rejected...some inconsistency from apple ? Though I suppose if you work for Apple now you probably know the answer but would not be inclined to share it. In any case, any insight you can provide would be appreciated. Hello, I created a Page Curl like filter using OpenGL and CoreGraphics. Speaking about Math, shadow casting, shader etc. was a nightmare :-) but it's realistic and it's very close to the iBooks one. I'm working on an easy-to-use API to integrate the GLView and other classes in a common project (like a PDF viewer). To resume, the logic behind it's based on a conical page deformation but to be realistic like iBooks, the Math is quite different from the Nuon algorithm. The filter is done, I hope to complete the API it in a couple of weeks then I'll publish it on github.